We recently examined institutional research productivity in the flagship APS journal, Psychological Science (PS). A research productivity study is a weighted empirical count of the institutions or individuals publishing in identified journals (Howard, Cole, & Maxwell, 1987). Research productivity studies serve several purposes: (a) they help identify leading and emerging centers of scholarship, (b) they assist in the recruitment and organizational fit of faculty and students, and (c) one outcome, the ordinal rank of contributors, is useful in decision making of university administrators, faculty, and students (Brooks, 2005; Toutkoushian, Porter, Danielson, & Hollis, 2003). Institutional research productivity was assessed in PS from its inception until the latest issue available (June 2009). 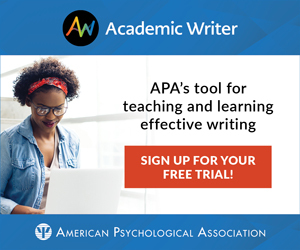 All articles were included in the analysis except for letters to the editor, book reviews, commentaries, presidential addresses, and test reviews. 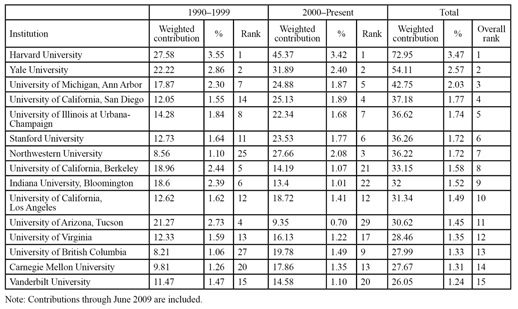 The rankings of institutional affiliation of author(s) were computed through the use of a weighted, proportional counting system devised by Howard et al. (1987). Results are presented in 10-year periods (i.e., 1990–1999 and 2000–present), as well as for the entire period. For the entire time frame, the top-ranking contributor is Harvard University (weighted contribution: 72.95 or 3.47 percent), by a margin of almost one complete contribution a year. Harvard is followed by Yale University, and the University of Michigan, Ann Arbor, is third. The top 10 contributors to PS come from well-respected psychology institutions and account for almost 20 percent of all articles in the journal, indicating that these institutions make steady contributions to the journal. An interesting trend in the data is increased attractiveness of PS to authors with foreign affiliations. There are four foreign contributors within the top 50 (two Canadian, one European, and one Israeli) and 24 in the top 100. Overall, the diverse set of institutional contributors to PS reflects the increasingly global reach of the study of psychological science. See the chart above for a listing of the top 15 institutions and click here for the full listing of the top 100.